Personal, Social and Emotional development-This week we have been thinking and talking about what makes a good friend and why our friends are important. It has been lovely to hear the children share some of the qualities that they think are important in a friend. We have also continued to work on demonstrating that we understand the rules in school. We are aiming to be a class of superstars by the end of the term. Physical development-We had our first P.E session on Tuesday morning and all I think it is fair to say that all the children thoroughly enjoyed it. They amazed me with how quickly they were able to get changed into their P.E kits. Once we were in the hall we played lots of games that involved us moving around and warming our bodies up. We thought about the ways that we could move our bodies in order to move like different animals. Communication and Language-On Monday we enjoyed sharing our weekend news with our partners and then the whole class. It is great to see the children’s speaking and listening skills developing each week. It might be helpful for you to talk to your child before school on a Monday about what they might like to share for their weekend news. Towards the end of this week we have also started to talk about our words of the week and the traffic light system. Literacy-We have continued to perfect our listening skills this week and have enjoyed being able to distinguish between different sounds. Our main literacy focus for this week and next is rhyme. We have been thinking of different rhyming words and matching them. This is an important part of our phonics development and it would be great if you could support your child with this at home. Maths- This week we have continued to look at patterns that we can see in the environment and patterns that we can create using things like instruments. We have also been working on recognising and ordering numbers to 10. Please help your child at home with their number recognition. Expressive art and design- This week we have continued to enjoy learning the songs for our Harvest festival. I have been really impressed with how well the children have learnt the words to the songs and enjoyed performing them. In addition to this the children have been inspired to create their own scarecrow pictures. The children worked in pairs to create their own moving scarecrow pictures and flying crows. These will be on display as soon as they are finished. Understanding the World-This week we have been talking about Harvest and why it is important. We enjoyed reading a story about a giant turnip and discussing why it was important for us to show appreciation for all the things that we are lucky to have and thinking about those less fortunate. P.E kits- Just to remind you that your child needs a named P.E kit in school all week. Weekend challenge-Thank you for supporting your child with their weekend challenge. This week’s challenge is to practice writing their name. 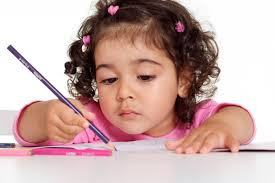 Please support your child to write their name. Remember that they only need to use a capital letter for the first letter of their name and the rest of the letters should be in lower case. It would be great if you could bring in some examples of this. They could write their name in sand, using playdoh, shaving foam, using big chalks on the floor, or anything else you can think of. Of course you could use pencil and paper!